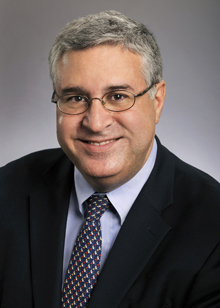 Fadlo R. Khuri, MD, deputy director of Winship Cancer Institute of Emory University, chair of the Department of Hematology and Medical Oncology, and executive associate dean for research at Emory University School of Medicine, today was named president of American University of Beirut (AUB) in Beirut, Lebanon. He will begin his tenure there on September 1, 2015 following a formal inaugural ceremony. Khuri, who is also the Roberto C. Goizueta Distinguished Chair for Cancer Research, is considered one of the leading translational clinical investigators and physicians in lung and aerodigestive medical oncology in the world. In his 13 years at Emory, Khuri has been instrumental in leading the development of some of the most important cancer-related programs in the State of Georgia and throughout the nation. "Fadlo Khuri has been a driving force behind Winship Cancer Institute’s positive trajectory since he first joined Emory in 2002," says S. Wright Caughman, MD, CEO of Emory’s Woodruff Health Sciences Center and executive vice president for health affairs at Emory. "His influence can be seen in many areas, including his pivotal role in earning National Cancer Institute Cancer Center Designation for Winship in 2009. We will miss Fadlo greatly but look forward to the many new exciting relationships that Emory will now forge with AUB." "Fadlo’s extraordinary leadership over the last decade has fully aligned cancer care with cancer research at Winship," says Walter J. Curran, Jr., MD, Winship’s executive director. "He has played a pivotal role in the recruitment, retention, and mentorship of a whole generation of Winship’s cancer caregivers and researchers." "Dr. Khuri is widely recognized as an international leader among clinical investigators and physicians in lung and aerodigestive medical oncology," says Christian Larsen, MD, DPhil, dean of Emory Medicine. "He has contributed greatly to Winship, to the Emory School of Medicine, and to Emory University thanks to his dedication to patients, his desire to beat this terrible disease, and his focus on innovative and collaborative science." Khuri, who grew up in Beirut, previously served on the faculty of the University of Texas MD Anderson Cancer Center. His maternal great grandfathers, paternal grandfather, father and mother were graduates of AUB. His father served as chair of the school’s Department of Physiology and dean of the AUB Medical School. "My thirteen years at Emory have been professionally the happiest and most productive years of my life," says Khuri. "Emory has afforded me the opportunity to grow personally and professionally thanks to the collaborative and creative environment that is fostered here. I am grateful to have had the opportunity to work with, learn from and mentor some of the finest scholars and individuals in the world. I am especially grateful to all of my patients for everything they have taught me." AUB is one of the preeminent universities in the Middle East and is ranked among the top universities in the world.